Even if a location hasn’t experienced a flood in recent memory, don’t assume it won’t flood in the future. Flood risk isn’t just based on history. It depends on a number of factors: rainfall, river flow, topography, flood-control measures, and local changes due to new development, construction, and erosion. Through the National Flood Insurance Program (NFIP), The Federal Emergency Management Agency (FEMA) maintains flood risk information for the entire country. 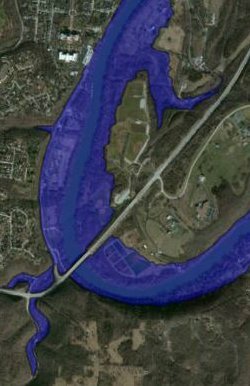 This information is available as Digital Flood Insurance Rate Maps (D-FIRMs), which show flood risk at the individual property level. The flood risk for your property is a major factor that insurance agencies use in setting your flood insurance premiums. To learn your flood risk, you can search for your address on the NFIP website (floodsmart.gov), consult your insurance agent, or contact the Lexington Division of Planning. You also can use the NFIP website to check the status of D-FIRM updates for your neighborhood. While much of Lexington may be rated as low or moderate risk, don’t get complacent! Even properties outside high-risk areas can flood. 25% of flood insurance claims are filed in low- and moderate-risk areas. If you’re thinking of buying a house, don’t expect your realtor to inform you of any potential flood risk. Many realtors are unaware of such issues. Also, don’t make decisions based solely on a property’s history of flooding or not flooding. As we mentioned above, changes nearby (or upstream) can increase or reduce a given property’s risk of flooding in the future. These changes are why FEMA regularly updates its D-FIRMs. Most homeowner’s and renter’s policies don’t cover flood damage. To ensure your financial protection against floods, you should review your existing policies so you know exactly what they cover. Also know the difference between standard coverage, which pays only the actual cash value of insured property, and replacement cost coverage. Consider the value of recent home improvements or renovations. One function of the NFIP is to assist homeowners with financial protection against floods. Lexington participates in the NFIP, which means we adopt and enforce floodplain management regulations and ordinances. Our participation enables FEMA to offer flood insurance to our citizens – homeowners, business owners, and renters. See the NFIP website for more information how to obtain residential coverage or commercial coverage. For all insurance purposes (not just flood insurance), you should inventory your household possessions. Make a written and visual (i.e., videotaped or photographed) record of all major household items and valuables, including those stored in basements, attics, or garages. Create files that include serial numbers and receipts for major appliances, power tools, electronics, and firearms. Have jewelry and artwork appraised. Store all these documents in watertight containers, whether they’re in paper or digital formats. These records are critically important when filing insurance claims.